36 months in the closed original package if cool and dry storage provided (=5°-25°C, relative air humidity of max. 60%). Protect from direct sunlight, frost and humidity. Wash headlights thoroughly to remove dirt. 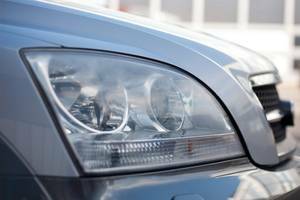 Mask the complete area around the headlight lens with a broad adhesive plastic tape to protect it from any treatment. Wet-sand (using water with the paper) the affected headlight area horizontally until the major imperfections are no longer visible using the sanding with the 2000 grit sandpaper and water. Remove residue. Wet-sand (using water with the paper) the affected headlight area vertically until the smaller imperfections are no longer visible using the sanding with the 3000 grit sandpaper and water. Remove residue. Wet-sand (using water with the paper) the affected headlight area horizontally again until the surface is smooth and uniform using the sanding with the 5000 grit sandpaper and water. Remove residue. 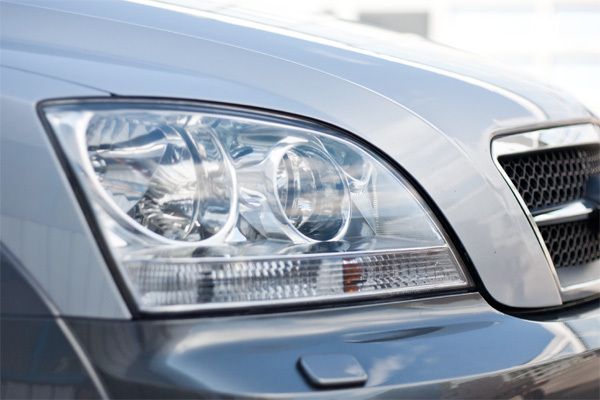 Apply some HEADLIGHT RESTORER on the headlight lens. Finally firmly polish the treated area vertically to a mirror finish using the HEADLIGHT RESTORER No.1, the polishing cloth and the rubber block. 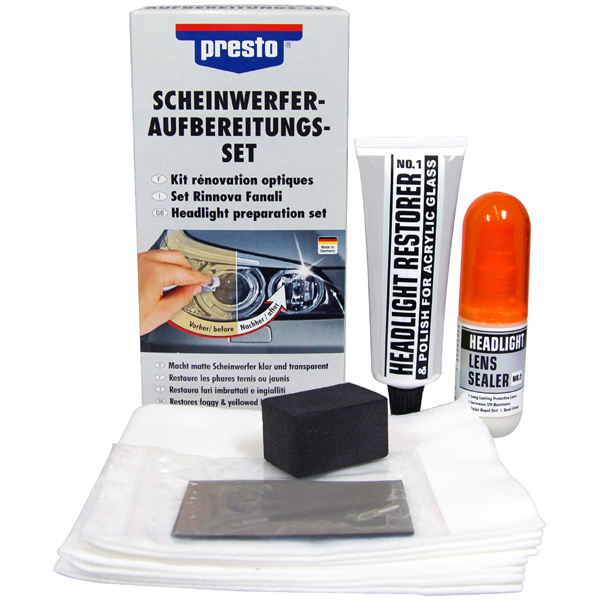 Firmly polish the lens to a mirror finish using the HEADLIGHT RESTORER No.1, the polishing cloth and the rubber block. Apply more pressure to speed up the polishing process. If the lens is in extremely bad condition and did not come clean with just the polish, start with step A. Remove any residue with a wet cloth. Remove the masking tape surrounding the lens. Clean the headlight lens thoroughly. Shake bottle very well before use. Spray some HEADLIGHT LENS SEALER No.2 onto the lens and spread it evenly with a enclosed cloth. Allow the sealer to dry to a haze (about 5 - 10 minutes). Buff the lens to a high gloss with a clean cloth. For a maximum protection repeat application every 3 months. Do not use on any printed, varnished or coated sufaces. Only use on foggy and/or yellowed plastic headlight lenses. Lenses with fine cracks or internal fogging will be not prepared completely.